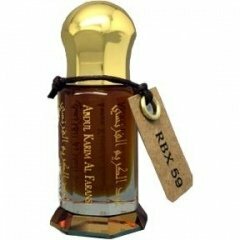 RBX 59 is a popular perfume by Abdul Karim Al Faransi for men. The release year is unknown. The scent is spicy-woody. The longevity is above-average. It is still in production. I do not know what to think of this perfume, there are moments that I dislike and moments that I like, and I'm there, at that crossroads, of whether I like it or not. Start with a floral note very camphorated, strange and annoying, at least to me, I have not liked anything. In a matter of minutes, that camphorated sensation lowers intensity and shows us with more details the floral notes, it is like a hodgepodge of flowers, from which the rose stands out a little, although nothing noteworthy. These flowers are mixed with traces of that initial camphorated sensation, although with a lot less intensity, and, even so, the resulting aroma still does not please me. Then, patchouli are added to these floral notes, recreating a floral and earthy aroma, with menthol nuances, on a creamy background of warm woods, very beautiful, and from here, it is when the aroma starts to taste. The woods are the protagonists of the drying, feeling the sandalwood with dirty nuances of oud and a sweet and warm little dot of vanilla and amber, through which the residual nuances of the combination of flowers-patchouli are revolted, this drying is wonderful, a pity that unfortunate start, because if it were not for him, the perfume would be a preciousness, but I give to me that this beginning is going to be a burden, at least, I will not be the one who goes for a full bottle. The aroma is original, I had never smelled anything like it, and it is not excessively arabesque, but that beginning with those camphor shades, dislodged me, and until they have completely disappeared, the perfume does not begin to please me. The duration is very good, remaining on skin for more than 8 hours, with a very noticeable wake at the beginning, but in a matter of half an hour it stabilizes and remains moderate. Perfume of cold and temperate climates, and to dress indifferently both day and night. As for your recommendation, I would not recommend it without a test before, so those interested in this concoction, buy the sample beforehand, so as not to be disappointed. Write the first Review for RBX 59!